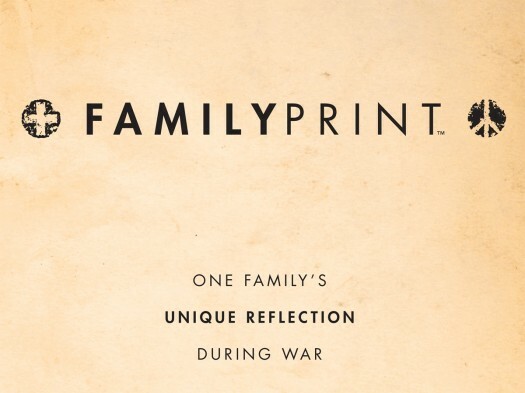 We are proud and excited to announce the launch of FamilyPrint: One Family’s Unique Reflection During War. It contains the experiences and communication we used during Tim’s deployment to: stay in touch, dispel our fears, display our love and articulate the gratitude we have for all of those that supported us. It also includes a stunning collection of images taken by Nathan Rowe in a 250-page coffee-table book. After several long months, our publisher has sent the book to print! We expect the pre-order copies to ship by the end of the month. To learn more about the book, please visit our web site for more information >>> click here to enter FamilyPrint. You can also click here to see the press release that went out to the media >>> press release. FamilyPrint is a nonprofit organization assisting the families of veterans deployed overseas. Striving to support both the soldier in harm’s way as well as the family here at home, FamilyPrint offers programs that assist with the outbound and inbound transition of the soldier, childcare support during deployment, financial assistance for families in need and care items for deployed soldiers. Thank you to the team that made this launch happen…IBJ Custom Publishing, Kate Berglund of KB Design, Molly Anderson of WriteSmart, Mike Barron, Amy Baker, and many others.